Wendy and I made it home last night with loads of great memories of a great show. I still haven’t unpacked the purchases and sewing stuff. Posting to my blog seemed a bit less challenging. 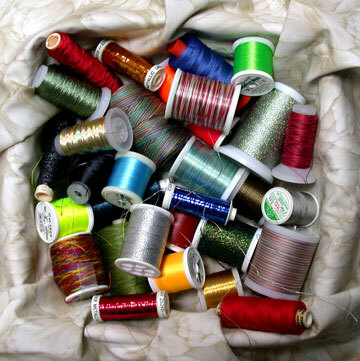 Superior Threads has an excellent email newsletter that you can sign up for at the above link. They share a lot of helpful information about thread and are more than willing to answer questions. One more suggestion I’ve found very helpful: if you do everything from the video and you still have some breakage (it happens), try threading a thin polyester thread in a matching color through your machine with the fancy thread. Run them all the way through as if they were one and thread the needle with both together. The poly won’t show, but will lend strength to the more fragile thread. What are your favorite fancy threads? Do you have any suggestions for dealing with fussy fibers?